Keep the air clean and pure wherever you are. Whether you’re traveling around the world or heading to the office, having a portable humidifiers can do wonders for the air around you. WHAT DOES A HUMIDIFIERS DO? Humidifiers are units that provide air with more moisture. Even though there are different type and makes of humidifiers, they all do the same thing: increase the level of humidity. Humidifiers reduce many of the nasty effects of cold weather. A humidifier can help you feel much more comfortable around the house during the bitter months of winter and even after winter ends the conditions in your home can be greatly improved by introducing a humidifier into your home. In hotter climates, too, a humidifier can help your home since the heat can cause air to be dry. WHEN SHOULD YOU TRAVEL WITH A HUMIDIFIER? You should use a humidifier whenever excessively low humidity occurs in order to achieve a healthier balance of moisture in a room or building – whether you’re on the road or not. Moisture in a room is essential for staying healthy and can help alleviate dry skin, chapped lips, cough symptoms and more. Most hotels will suffer from an imbalance of moisture, especially during winter months, and so most people that do travel a lot can benefit from purchasing a portable humidifier. Humidifiers Keep You Healthy – Ever feel all bunged up in cold or dry weather? Well, that is because of a lack of moisture in the air. Humidity allows the tiny hairs in your nose to move and do their job of filtering out bacteria and viruses which cause colds and the flu. By adding moisture to your home, you are allowing those tiny hairs to do their job, and keeping yourself healthy. Treats Illness – If you are already sick, air moisturized with a humidifier can help soothe the symptoms of colds or flu. When the air is too dry your sinuses don’t drain and function correctly, leaving you feeling blocked up and in pain. Helps You Heal Faster – Humidifiers don’t only treat your illness and relieve your symptoms, but they also allow you to heal faster. Humidifiers Reduce Snoring – Snoring is caused by low moisture levels in your nose and soft palate. Moisture can also be added to the air with a humidifier. By adding this moisture, you fight off the dryness that leads to snoring – leaving both you and your partner happy. Moisturize Your Skin – Blasting the heat throughout your home during the winter months dries out the air. This can leave your skin looking and feeling tight, dry and itchy (especially around areas like your hands). Dry air also causes chapped lips more often and more easily in winter which can often feel painful. By sleeping with your humidifier on at night, you can add moisture to the air. Help Reduce the Appearance of Wrinkles – Making sure that the wrinkles do not show up in the first place is the best way to treat them. The drier your skin is, the more prominent your wrinkles become. A humidifier helps fill the room with nourishing, moisturizing steam that can smooth out your skin and help reduce the appearance of wrinkles. Help to Prevent Breakouts – When you strip the oils from your face with a cleanser, your skin is forced to produce even more oil to compensate which can result in a nasty breakout. Similarly, when the air dries out the sensitive skin on your face, your oil production kicks up and may cause blemishes. Keeping the correct humidity levels in your home helps banish acne and soothes dry skin. Combine the use of the humidifier with applying moisturizer specific to your skin type to further improve your skin and keep it looking amazing as well as breakout-free. Sleep Easier – If you have a have a baby or toddler in your home, then setting up a humidifier in their room will help them sleep and feel better. Babies tend to be more comfortable and sleep better in a humidified environment. The best part is that a comfortable, sleeping baby provides a restful night for everyone in the house. 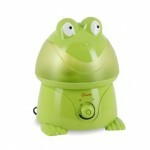 Try the Crane Adorable Ultrasonic Cool Mist Humidifier. Breathe Easily – Providing moisture to the air in your baby’s room is one way to make sure your child is more comfortable, especially if you can tell that he or she is fighting a cold. 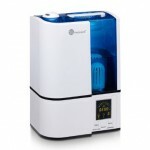 The moisture provided by a humidifier can help in loosening congestion. During the times of sickness, the heated air in our homes, especially during winter, can make your baby’s nose burn. This often leads to endless crying until the issue is resolve by putting on the humidifier. 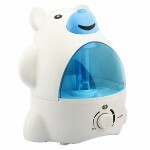 Try the SPT Polar Bear Ultrasonic Humidifier.